The details of Sofonisba Anguissola’s life show that she had the physical and geographical opportunity to paint a mature Catalina Micaela that her male contemporaries El Greco and Coello did not being far away in Spain. Sofonisba also had personal insight into the Infanta’s private world to render the Infanta of Spain, Catalina Micaela, as the Lady in Ermine. Based on chronological and geographical evidence in the historical record, neither El Greco nor Coello could have painted Lady in Ermine or Woman in a Fur Wrap. It must have been by Sofonisba Anguissola. Consensus is that the Infanta Catalina Micaela (1567-1597), daughter of Philip II of Spain and Isabel de Valois, was the sitter for the beautiful and inventive Lady in Ermine or Woman in a Fur Wrap as it is called by the painting’s owner, Culture and Sport Glasgow (Pollok House). Opinion is divided, however, over who authored Lady in Ermine. Pollok House attributes the painting to El Greco. Leticia Ruiz Gomez of the Prado museum and author of El Greco (Aldeasa, 2000) believes it to be by Sanchez Coello. Maria Kusche, an expert on Spanish and Italian sixteenth-century art who wrote Retratos Y Retratadores: Alonso Sanchez Coello Y Sus Competidores (Fundación de apoyo a la Historia del arte Hispánico, 2003) believed that Lady in Ermine was painted by Sofonisba Anguissola. While stylistic analysis is divided among the art experts, timing, geography, and biography tell us the painting could only have been by Sofonisba Anguissola. First, timing and geography are simple deal breakers: Catalina Micaela was only eighteen years old in 1585 when she left her home in Madrid to travel to Turin where she became the Duchess of Savoy. As the common eye can see, no expert opinion needed, the sitter in the painting is simply older than eighteen years of age. The sitter in Lady in Ermine is a woman in her mid to late twenties. Catalina Micaela lived until 1597 when she died in childbirth at the age of thirty. The painting had to be executed during the later years of her tenure in Turin, in the 1590s. During Catalina Micaela’s entire tenure as Duchess of Savoy in Turin from 1585 to 1597, El Greco resided in Toledo, having been rejected by King Philip in Madrid. Coello, meanwhile, was Philip II’s own painter in Madrid, but he last saw the Infanta when she was only eighteen years old, too young to be the mature woman in the painting. Sofonisba, on the other hand, was in Genoa from 1580 until 1615, about 200 kilometers away from Turin, a five or six day journey by carriage or horse, giving Sofonisba opportunity to paint a mature Catalina Micaela in her late twenties. Neither El Greco nor Coello had any opportunity to see the Infanta during those years, let alone have her sit for them. In addition to having the superior opportunity to paint a mature Catalina Micaela, Sofonisba had a closer connection to the Infanta Duchess than either of her male contemporaries, as I examine in detail below. Privacy certainly had a different character in the sixteenth century than it does in the modern world, but Sofonisba Anguissola had a unique window into Catalina Micaela’s private world. Sofonisba helped to protect that world, and even to define it. She knew Catalina Micaela privately. Having researched Sofonisba’s life for Lady in Ermine: the Story of a Woman Who Painted the Renaissance (Bagwyn Books, 2019), I can say without hesitation that Sofonisba had an intimate relationship with the Spanish Habsburgs, with whom she lived for over ten years, accompanying the family through illnesses, scandals, and many tragedies. El Greco was commissioned at that time and tried to gain Philip II’s favor with The Martyrdom of St. Maurice which he completed in 1582. The king was so displeased with the execution, he had the piece relegated to a subchapel rather than show it in the main chapel for which it was commissioned. That was not sufficient proof of his displeasure. The king banished the artist from the royal court in Madrid. El Greco had hoped to paint at the Habsburg court (like Sofonisba succeeded at doing), but instead, El Greco was dispatched to hover in Toledo while the court of Philip II firmly established Madrid and the rising Escorial as the seat of Spanish Habsburg power. Coincidentally, of the main figures in The Martyrdom of St. Maurice, one is possibly Emanuel Filibert of Savoy, Catalina Micaela’s future father in law. (Ruiz, p. 28) Could El Greco have painted Catalina Micaela on the one occasion when he encountered the king, the one occasion when he was in contact with the royals? Even if there were a single piece of evidence to support El Greco meeting Catalina Micaela in 1579, and there is not, the Infanta was only twelve years old at the time of the king’s contact with El Greco. Catalina Micaela as the Lady in Ermine was a grown woman. It is fair to say that El Greco not only never personally knew the Infanta Catalina Micaela, he never met her, saw her in person, and certainly would not have had the inventive space to find the tenderness reflected in the beautiful rendition of her in Lady in Ermine. Such tender portraiture cannot be painted from afar. The Treaty of Cateau-Cambresis arranged the marriage of Elisabeth, now called Isabel, de Valois to Philip II of Spain and also reconfirmed Spain’s occupation of Lombardy where Sofonisba built her artistic reputation. Sofonisba was one of 17 original ladies in waiting to Catalina Micaela’s mother, the former Elisabeth de Valois, daughter of King Henry II of France and Queen Catherine de Medici, who was originally from Florence and Rome. Eight Spanish ladies and eight French ladies in waiting supplied the rest of the new Spanish Queen’s court. Sofonisba stood out from 16 other attendants, the only lady in waiting from the same peninsula as Isabel’s mother Catherine de Medici, and the only lady in waiting with a recognized talent. Sofonisba’s early successes were well known by 1559, which is why she was called to such an illustrious role as lady in waiting to a queen. Her Boy Bitten influenced Michelangelo in the mid 1550s. The aged master and Sofonisba’s father exchanged letters. Sofonisba’s documented 1550s visits to the courts of Mantua, Parma, and Piacenza made her known among the Gonzaga and the Farnese, among the most ravenous art patrons and collectors of the time. Because Spain occupied those areas of the northern Italian peninsula in the 1550s, it is likely that the Duke of Alba, Philip’s right hand advisor, discovered Sofonisba when he was sent to Lombardy in the 1550s to be Captain General of Italy when Sofonisba’s father was a local decurion, a diplomat, and helped commission local art. Sofonisba’s father had influences in diplomatic and artistic circles of Lombardy. Sofonisba’s connection to Catalina Micaela began as soon as Sofonisba arrived in Spain to be present for the royal wedding festivities. In fact, Sofonisba is reported as the first person to dance at the royal wedding. According to Girolamo Neri, the Ambassador to the Duke of Mantua, Gugliemo Gonzaga, writing about dancing at the wedding banquet, “il signore Ferrante Gonzaga fu il primo, ch’incomincio`; quale ando` a predere quella Cremonese che dipinge, ch’e` venuta a star con la regina, et fece la via a molti altri che ball arono dapoi.” [Signore Gonzaga was the first to begin; he went to take the one from Cremona who paints, who came to stay with the queen, and [they] made a path for many others to begin dancing after.] (Catalogue, 367, citing ASMn Gonzaga, Esteri 590, letter dated February 8, 1560). Undoubtedly, Isabel and Sofonisba were homesick together. At the time of the royal wedding, Sofonisba was in her early twenties and left her large closed-knit family of five younger sisters and a younger brother at home. The new queen Isabel was fourteen and left her siblings and mother at home in Paris. The young queen had just lost her father. The King of France was killed in a joust commemorating his daughter’s marriage to the Spanish King. In January 1561, Queen Isabel was near death with fever for over a month. Sofonisba remained at her court attending her. In February 1561, Girolama Neri, Ambassador to the Duke of Mantua wrote that, “dice la Sofonisba cremonese, che e` quella che le insegna, et e` molto favorita sua, che ritra dal naturale con un carbone, in manera che si conosce subito la persona che ha ritrata.” (Catalogue, 367, citing ASMn, Gonzaga, Esteri 591). [Says Sofonisba the Cremonese that she whom she teaches (Queen Isabel) is very good and paints naturally with a crayon in a way that one quickly recognizes the person painted.] Sofonisba was close enough to the queen to comment upon her progress. The following May, Sofonisba received a pension from the Crown, and then another in July. In July of 1561, King Philip awarded Sofonisba tax revenue previously given to Isabella Sforza (again, while El Greco is banished, Sofonisba receives the king’s backing). That same year, Sofonisba painted Philip II’s sister Juana. In 1562 Sofonisba painted the king’s nephew Alessandro Farnese, son of the Duchess of Parma, natural child of Charles V and therefore King Philip’s half-brother. Sofonisba’s rendering of his sweet face and gorgeous cloak, today at the Dublin Museum, is one of the most striking Renaissance portraits, frequently cited for the brilliance of the cloak. The image was ordered reproduced by Cardinal Farnese in fresco for the Palazzo Caprarola. (Catalogue, 99). In December 1563, the crown gave Sofonisba a new stipend and then extra money for servants at the beginning of the next year. In 1564, Sofonisba’s sister Minerva died. Yet, Sofonisba remained at court serving Catalina Micaela’s mother. In 1565, Sofonisba’s sister Lucia died, yet, Sofonisba remained at court to serve Catalina Micaela’s mother. In 1565 Sofonisba painted Catalina Micaela’s mother Isabel for her official portrait for the Bayonne conference in which Isabel would be reunited with her mother Catherine de Medici for the first and only time. Sofonisba renders the king in miniature in the palm of her friend’s hand. In 1566, Catalina Micaela’s mother Isabel wrote a will that included all of her ladies in waiting. Sofonisba was designated 3000 scudos, not the largest bequest, but twice the amount that most of the ladies in waiting were designated, plus a particular brocade bed cover. Sofonisba was the only lady in waiting bequeathed such a personal gift. Given that the bed represents marriage, we can infer that Catalina Micaela’s mother wanted to see Sofonisba married, a touching tribute to their closeness as women and friends. In 1566, Sofonisba received another 75,000 maravedis raise from the crown. On August 12, 1566 the Infanta Isabella Clara Eugenia was born while Sofonisba was attending as Queen Isabel’s lady in waiting. Sofonisba received too many stipends and raises during this period to delineate here. On October 10, 1567 the Infanta Catalina Micaela was born while Sofonisba Anguissola attended as her mother’s lady in waiting. A half year after Catalina Micaela was born, on May 7, 1568, Coello was tasked with copying 13 times Sofonisba’s painting of the King’s son Don Carlos, the uncle of Catalina Micaela. To command 13 copies of Sofonisba’s work from the official court painter is quite a testament to the king’s faith in Sofonisba’s representation of the Habsburg line. Within a three month period in 1568, when Catalina Micaela is still an toddler, tragedy struck the Spanish Habsburgs twice, devastating the court. We see the intimate rapport between Sofonisba and Catalina Micaela’s mother in a letter from Bernardo Maschi, the ambassador to Francesco Maria della Rovere, the future Duke of Urbino, writing to his master that Sofonisba was devastated by the tragic events, “la signora Sofonisba dice che non vuol piu` vivere.” [Sofonisba says she no longer wants to live. ](Catalogue, 373 citing ASFi, Ducato di Urbino, Classe I, divisione G, Filza 184, c. 54; G. Gronau, Documenti artistici urbinati, Firenze 1936, p. 268, n. 437). October 4, 1568. Sofonisba left six younger siblings behind in Cremona when she went to Spain in 1559. The fact that she alone among the ladies in waiting chose to stay in Madrid to comfort the family after its tragedy was notable even to the diplomats at court. Sofonisba must have felt for the young Infantas, ages one and two. Sofonisba had, after all, helped bring up her own younger siblings. And she was rewarded that year with two more stipends from the crown. Sofonisba’s dedication to the Infantas Catalina Micaela and Isabella Clara Eugenia was not fleeting. Two years later, the French ambassador to Catherine de Medici, the Queen Mother of France and Catalina Micaela’s grandmother, wrote to Paris that her granddaughters remained in the care of Sofonisba. (Catalogue, 376, citing Depeches de M. de Fouquevaux, ambassadeur du roi Charles IX en Espagne 1565-1573, Paris 1896-1904, II, p.295.) Given Sofonisba’s extensive education and tenure at court, she would have made a model example of the refined, Renaissance woman, the perfect accompaniment for the Infantas. El Greco was never close enough to the king to paint his portrait. Sofonisba, on the contrary, began her rendition of the king after she accompanied Queen Isabel to the Bayonne conference, after which, the royal couple finally became pregnant. Sofonisba was the queen’s close companion during her many years trying to conceive the Infantas. Sofonisba knew intimately how precious the Infantas were—even before they were born. Sofonisba continued to serve at the Spanish Court until 1572 when King Philip personally arranged her marriage. On April 28, 1573 King Philip bestowed upon Sofonisba an annual pension of 1000 ducats, on top of the many, many stipends she had earned over her decade-plus at court. On June 21, 1573, the Ambassador to the Duke of Mantua reported to his master the proxy marriage of Sofonisba to her newly arranged husband Fabrizio Moncada of Sicily. Sofonisba’s proxy ceremony took place in the Alcazar chapel in Madrid in the presence of Queen Anne of Austria, the Infantas, and the king’s sister Princess Juana. Catalina Micaela was almost six years old when she attended Sofonisba’s proxy wedding, an age at which she would remember such a celebrated event. Before departing from the Spanish Court, Sofonisba painted Catalina Micaela posed with a little monkey ( US, private collection, Catalogue, 104) and her sister Isabella Clara Eugenia (Torino, Galleria Sabauda, Catalogue, 104). Sofonisba also painted Queen Anne of Austria (Prado Museum, Madrid). Sofonisba was truly the portraitist of Philip’s family. She was attached to the Infantas. She was married in their presence and graced her marriage bed with the damask cover that she inherited from their mother Queen Isabel. Meanwhile, El Greco remained estranged in Toledo, never to touch or witness the realm in which Sofonisba glided. Sofonisba went on to a five year marriage in Sicily that ended tragically when her husband was attacked by pirates while en route to seek Philip II’s favor regarding a disputed inheritance. The Moncada inheritance dispute was eight years running but Sofonisba’s husband saw her close connection to the Habsburgs and was inspired to seek King Philip’s personal intervention in his years-long dispute. Sofonisba’s strong affiliation to the royals emboldened a Spanish nobleman from the highest echelons of Spanish hierarchical society to seek the king’s personal favor—an undeniable testament to the strength of Sofonisba’s connection to the crown upon which her husband felt confident to rely. Sofonisba commemorated her marriage to this Sicilian nobleman with a thematic painting in the local Sicilian style, Madonna dell’Itria, painted in 1578. For many years, Madonna dell’Itria was rejected as Sofonisba’s until Alfio Nicotra of Catania discovered Sofonisba’s official donation document to the Franciscans. Sofonisba’s legacy is denied over and over, only to be proven again and again. While returning to Genoa, more tragedy struck in Sofonisba’s life. She and her new husband took refuge for a time in Florence under the patronage of Francesco de Medici whom Sofonisba knew from her years at the Spanish court. Francesco understood Sofonisba’s close connection to the crown and was happy to ingratiate himself with Sofonisba. During her tenure at de Medici court in Tuscany from January to April 1580, Sofonisba painted Francesco de Medici himself, and his twelve year old daughter Eleonora de Medici, the future duchess of Mantua and patron of Peter Paul Rubens and Anthony van Dyck. This painting today is housed in Madrid at the Fundacion Lazaro and the resemblance between Sofonisba’s 1580 portrait of Eleonora de Medici and Sofonisba’s future portraits of Catalina Micaela are evident to the common eye. Sofonisba will later paint Eleonora de Medici as a mature woman. In 1585, at the age of 18, Catalina Micaela was arranged in marriage to the Duke of Savoy, whose capital was in Turin, Italy, 121 kilometers/75 miles from Genoa where Sofonisba was residing with her husband the ship captain. To get from Madrid to her new home in Turin, Catalina Micaela had to travel from Madrid to Barcelona, where she boarded a ship for Savona. From Savona, she traveled overland to Turin. On the 26th of June, 1585, the Ambassador to the Republic of Genoa reported that upon Catalina Micaela’s arrival at the port town of Savona, she was greeted by a delegation of dignitaries from the Republic of Genoa, who had been transported to meet her there by none other than Sofonisba’s husband, the ship captain, on his vessel, la Patrona. (Catalogue, 388 citing Archivio Civico di Genova). Sofonisba was with her husband to greet the Infanta. [This Savona trip is also referenced in a letter of Gabriello Chiabrera, Cat. 392] On that occasion, Sofonisba painted Catalina Micaela in a regal state portrait that echoes the 1565 Bayonne Portrait that Sofonisba painted of Catalina Micaela’s mother Isabel. The same belt, necklace, collar, and right-hand rings are a testament to Sofonisba’s connection to both Queen Isabel and the Infanta Catalina Micaela. Catalina Micaela lived in Turin as the Duchess of Savoy for the next twelve years, from 1585 until her death in childbirth in 1597 at the age of thirty. Sofonisba was nearby in Genoa during this period. El Greco, on the contrary, was painting in Toledo during the 80s, 90s, and early seventeenth century. There is no record of El Greco in Turin during Catalina Micaela’s tenure as Duchess of Savoy. His Italian period preceded his time in Toledo. In 1585 El Greco was a tenant of the Marquis de Villena. In 1586 he painted the Burial of Count Orgaz in Toledo. Catalina Micaela was travelling that year to Turin: by coach from Madrid to Barcelona, by ship from Barcelona to Savona, where she was reunited with Sofonisba, then on to Turin overland. How possibly could El Greco have painted her from his apartment studio in Toledo? In addition to the arrival portrait in 1585, Sofonisba had several opportunities to paint Catalina Micaela during her twelve year tenure in Turin. 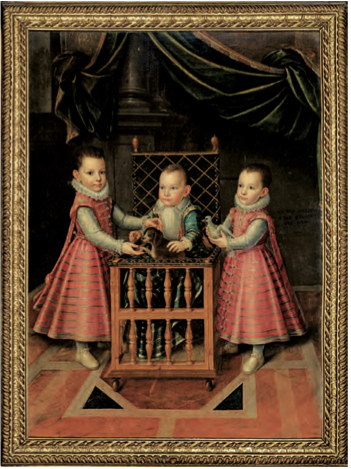 Alfio Nicotra has identified at least three periods: in 1589 to paint a triple portrait of the first three children Catalina Micaela had with her husband the Duke of Savoy, titled Principi di Savoia (1589) and the Duke himself (Carlo Emanuele I di Savoy, today at the Palazzo del Quirinale Rome), in 1591 when she painted Catalina Micaela, Lady in Ermine, and in 1595 when she painted Lady of Savoy (passing a vessel). (See Catalogue, 143) Because Sofonisba lived a short distance away, she had access to Catalina Micaela to continue her representations of the Habsburg family line. The common eye can see the resemblance between the Lady of Savoy (the eldest daughter of Catalina Micaela) posed with her intimate friend, a dwarf, and Catalina Micaela as Lady in Ermine. The family resemblance is evident in the eyes, the cheeks, both in coloring and bone structure, the lips, the forehead, and very much the mood of the paintings. In Lady of Savoy, the vessel that Catalina Micaela’s daughter passes to her dwarf can be interpreted as representing the passage of the female line from Isabel de Valois to the Infanta Catalina Micaela to the granddaughter Margherita, the Lady of Savoy. Having also met Catherine de Medici in 1565, Sofonisba was personally connected to four generations of Catherine de Medici’s women. In contrast, El Greco’s portraits are blurry, fantastic, removed. Here’s El Greco’s Portrait of a Man c. 1595 in a Photo I took at The Met, New York City. And overall, the arc of his work leans more toward the large scale thematic style from which Sofonisba departed with portraiture “naturale”—El Greco’s body of work was relatively more impersonal compared to Sofonisba’s renderings of the line of Valois women, nostalgically evoking the closeness that Sofonisba felt for Queen Isabel when she nursed her through a month of fever, an early miscarriage, two child births, and desperate tragedies. And, compared to Sofonisba’s 1580 Portrait of Eleonora de Medici (Fundacion Lazaro, Madrid), we see that Lady in Ermine shows a similar beauty. In these 1580s portraits, Sofonisba shows beauty in the midst of formative personal moments in these women’s lives: Eleonora suffered the death of her mother and the transition to her step mother and Catalina Micaela transitioned from being an Infanta in her homeland to a duchess in a distant land. On July 12, 1624, the northern painter Anthony van Dyck traveled to Palermo, Sicily and paid a visit to the legendary Sofonisba. Van Dyck recorded touching observations about Sofonisba in his notebook, today at the British museum. And while Anthony van Dyck was sketching Sofonisba, who else did he visit in Palermo? None other than Catalina Micaela’s son. In 1623, Catalina Micaela’s son Emanuele Filiberto of Savoy was made viceroy of Sicily. Catalina Micaela must have ordered the young painter to Sicily to record her son’s reign and pay homage to Sofonisba. (Dulwich, Dulwich College Picture Gallery, Kusche and Pagden p. 97) Sofonisba had painted Emanuele Filiberto as a child in the triple portrait of 1589. (Nicotra, incontri, 5, Oct-Dec. 2013, figure 6). Sofonisba’s private connection to the family of Catalina Micaela was enduring, from her parents Philip II and Isabel de Valois, the King and Queen of Spain, to her sister the Archduchess of the Spanish Netherlands, to her children and husband painted in the 80s-90s in Turin, to her son the Sicilian viceroy, when Sofonisba was living in Sicily and Anthony van Dyck was sketching her into his diary. The Lady in Ermine’s son, the Viceroy Emanuele Filiberto, died in Palermo in 1624 of the plague that was decimating the city. Sofonisba died the following year, possibly affected by the same plague. Sofonisba Anguissola was personally familiar with the house of the Spanish Habsburgs and Catalina Micaela, the Lady in Ermine. In fact, we find few individuals outside the royal line closer to Catalina Micaela than Sofonisba. From that deep personal knowledge, Sofonisba employed her Lombard portraiture style to render the mature Catalina Micaela as the touching Lady in Ermine. El Greco and Coello, meanwhile, were across the Tyrrhenian sea during Catalina Micaela’s mature period, 1500 kilometers, one sea voyage, and two over-land treks away. The 16th century artist, critic, and historian Giorgio Vasari is best known for his voluminous Lives of the Artists series where he painstakingly documents the biographies and styles of the great Renaissance masters. Master portraitist Sofonisba Anguissola inspired Giorgio Vasari. In 1566, Giorgio went to Cremona in Northern Italy to visit Sofonisba’s childhood home. Sofonisba was not present during his visit to Cremona. She was in Spain serving at the court of Philip II. Stunned by Sofonisba’s Chess Game and her Family Portrait, Giorgio said Sofonisba made her figures appear truly alive, a testament to her mastery in portraiture according to Leonardo, who resided in Milan at the dawn of the 16th century. Vasari was familiar with Sofonisba’s reputation in Roman circles from the 1550s. She influenced Michelangelo with her Boy Bitten by a Crayfish. She painted a portrait of Isabel Queen of Spain for Pope Pius IV in Rome in 1561. Giorgio Vasari was also a portraitist. He painted Catherine de Medici’s wedding portrait before she went to Paris to marry Henry II King of France. After visiting the Anguissola household in 1566, Giorgio Vasari began his greatest self-portrait, housed today at the Uffizzi in Florence. In it, Giorgio highlights his own face and hands, indicates his occupation, and shows the depth of his feeling on a muted background. His 1566 self-portrait is so similar to Sofonisba’s style, one could superimpose the face of any of Sofonisba’s sitters upon it. Perhaps it was Giorgio’s tribute to Sofonisba. Sofonisba lived a long prolific life. She began studying with Bernardino Campi around 1545. She died in 1625 and painted until at least 1610, probably longer. At the end of her life, she told Anthony van Dyke she wanted to keep painting in her last years, but her failing eyesight forced her to quit. Still, Sofonisba painted for at least sixty-five years, probably more. She had her experimental early years, her Lombard portraiture years, her court years in Spain, and her long post-court period painting everything from royal portraits to Madonnas to miniatures. And yet, we are fairly certain of only 57 or so of her paintings, with some attributions disputed or in flux. See partial list of Sofonisba’s work. There must be more. Even if she did just one piece of art work every year, she has a body of work out there of at least sixty-five pieces. But Sofi was prolific. She had to have done at least two a year. But two only? As prolific as she was, might she not have done at least three, four, five pieces a year? Five pieces a year from someone who sketched (drawing of crying baby to Michelangelo) and painted all the influential people she met (the King of Spain, Francesco de Medici, the Archduchess of the Spanish Netherlands), varying her styles all along (self portraits, portraits within portraits, landscapes, miniatures, massive Madonnas, mannerist holy families). At five a year, Sofonisba might have a body of work out there, as yet to be discovered, somewhere along the lines of 325 pieces! It’s possible. We know of Titian’s volume of work. If Sofonisba’s life story tells us one thing, it’s that her gender never stopped her from painting. I am a big fan of Alfio Nicotra, originally of Paternò Sicily, the town of Sofonsiba’s first marriage. Dr. Nocotra discovered Sofonisba’s Madonna dell’Itria and attributed it to her in 1995. Scholars disputed the attribution because it was so stylistically experimental compared to her accepted body of work, but Dr. Nicotra persevered. Then, in 2002, he found a document proving Sofonisba’s authorship, a letter in which she donated the painting to the local Franciscans of Paterno, dated June 25, 1579. Dr. Nicotra never doubted the range of Sofonisba’s work, in style and volume. Dr. Nicotra has attributed a dozen or so paintings to Sofonisba, including 1580 portraits of Francesco de Medici and his daughter Eleanora, the future Duchess of Mantua and patroness-to-be of Peter Paul Rubens. Today, Sofonisba’s family continues the search for her work, with Dr. Ferrante Anguissola hosting Progetto Sofonisba to help promote and discover Sofonisba’s legacy. There’s certainly a movement going on to discover Sofonsiba’s life and work. Museum guides and survey art history books in the 80s, 90s or 2000s rarely mentioned Sofonisba. Not so today. I was in San Francisco’s De Young museum yesterday and picked up a book on Velazquez by Javier Portus and went to the index. There she was, Anguissola, Sofonisba, at least in a note. In Rome, at the Doria Pamphili Gallery, Sofonisba’s Portrait of Husband and Wife used to be displayed on a main gallery wall along with the other great Renaissance masterpieces the Doria Pamphili owns. Today, that piece is in the prince’s private apartments, peeking out of a window where the public can just barely spy it. Of all the masterpieces the family could choose to covet, they picked Sofonisba’s. It only proves her growing allure. I hope the movement to discover Sofonisba can unearth a few hundred more pieces for us to study and enjoy. I wonder if Velazquez’s Prince Baltasar Carlos was also influenced by another of Sofonisba’s paintings, one recently attributed to Sofonisba, her Portrait of the Princes of Savoy, the First Children of Carlo Emanuele e Caterina Micaela (1589, Torino, attributed by Alfio Nicotra in Incontri, Oct, 2013). Velazquez centered the baldish baby heir the same way Sofonisba did. The dress Velazquez gives Prince Baltasar Carlos angles backward just like the right figure in Sofonisba’s. 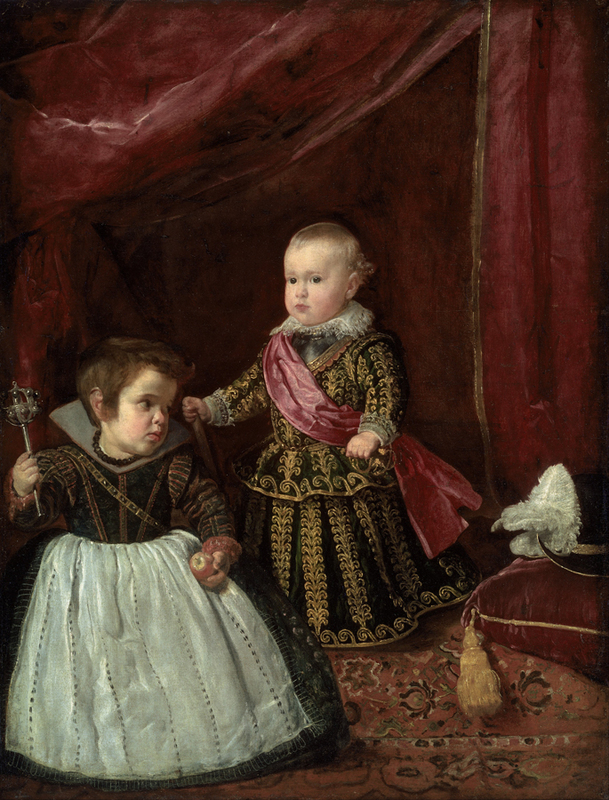 Then the folds in the dress of Velazquez’ dwarf on the left echo the folds of Sofonisba’s prince on the left. The arms of the figures in both portraits reach toward the center, as if creating an invisible circle. The drapery above and dark backgrounds behind the children are similar in each. The luxurious carpets beneath both have similar horizontal bands framing the bottoms of the portraits. Both pieces are highly detailed in gold. Even if we cannot be certain whether Velazquez copied Sofonisba, we do know who came first. Her Princes of Savoy preceded his Prince Baltasar Carlos by forty-three years.